multiple All-American honors. Photo courtesy of Furman. After leading a turnaround season by paving the way for one of the best offenses in the FCS this season, members of Furman's offensive front continue to rack up national honors. On Tuesday, Matthew Schmidt added to his collection as he made the STATS FCS All-America second team. Schmidt is also an Associated Press second team All-American and a Phil Steele third team All-American. Schmidt also was a consensus All-Southern Conference first team pick and earned the league's Jacobs Blocking Award. Given his postseason haul thus far, Schmidt will likely be a part of the American Football Coaches Association All-America team announced Wednesday as well. 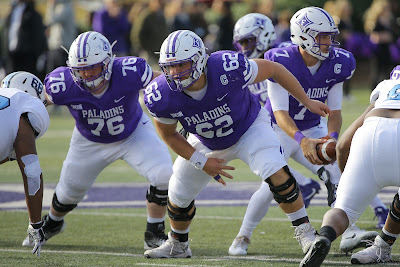 Schmidt, a senior co-captain, started all 13 games at center for the Paladins (8-5) giving him a total of 39 starts along the line in his terrific career. This season, Schmidt helped Furman average a SoCon-best 32.6 points per game and 6.3 yards per play. The Paladins also allowed the fewest sacks in the country with seven. "I think (offensive line coach) Pete Lusk did a great job with him, but I tell you what, he was a good player when we got here," Furman coach Clay Hendrix said. "That kid might be the ultimate team guy. He bought in from day one to what we were selling and he made those other guys around him better. He was never redshirted, so I just kind of hate that we didn't get him another year." Despite playing multiple positions along the offensive line and snapping out of multiple sets in a new offensive system this season, Schmidt seemingly never had a bad snap. "With a defensive lineman, you don't mind the bad plays because of the good plays they can make. With an offensive lineman, a bad play will just kill you." Furman tight end Andy Schumpert joined Schmidt on Phil Steele's All-America third team. Schmidt, Schumpert and offensive guard Terrell Bush were all first-team All-SoCon selections. 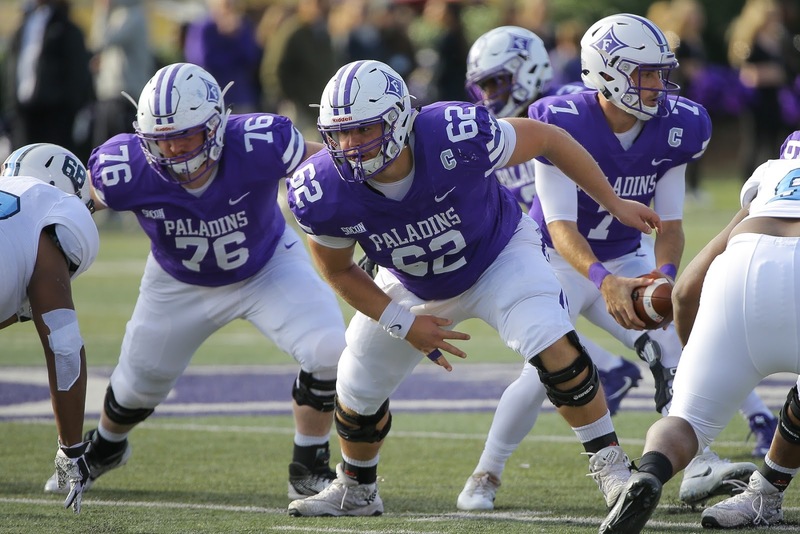 Furman's Reed Kroeber, who started the first three games at left tackle and the final 10 at right guard, made the HERO Sports FCS Freshman All-America team. Since the season ended Dec. 2, Hendrix and his staff have been busy on the road recruiting ahead of college football's new early 72-hour signing period that begins at 7 a.m. Wednesday. Hendrix noted a key was making sure the offensive front depth was well stocked following the graduation of Schmidt, Bush and Schumpert. "There's not a senior in the group next year, but we've just got to become more athletic and more durable and we will," Hendrix said. "This offseason will be huge for our football team." The other senior starters that will have to be replaced are quarterback P.J. Blazejowski, running back Antonio Wilcox and wide receiver Logan McCarter. On The Dan Scott Show Tuesday, Furman recruiting coordinator Duane Vaughn said he expects a total of about 17 signees in this year's class. Vaughn believes 10 or 11 of those players will sign Wednesday, while the others will file their paperwork on the traditional signing day of Feb. 7. In the middle of the recruiting efforts, Hendrix announced that George Quarles will take over as Furman's new offensive coordinator. Quarles replaces Drew Cronic, who left to take the head coaching position at Lenior-Rhyne. Quarles and Cronic were part of the new staff hired by Hendrix prior to this season. "I'm happy for Drew. He did a great job for us and we wish nothing but the best for him and his family," Hendrix said. "When I was kind of putting things together this time last year, I really felt like we hired two guys that could (be offensive coordinator). I don't think we will miss a beat going forward. "The plan for me was to put a system in place and then if you lose a coach, the system doesn't just go away. I want guys that can work within our system." As associate head coach and tight ends coach, Quarles was a key part of perhaps the most important move last preseason for Furman. After catching one touchdown in his first three years combined at wide receiver, Schumpert hauled in nine touchdowns this year at tight end. Schumpert, who consistently burned opposing defenders on deep throws by Blazejowski, had 652 yards receiving on just 32 catches (20.4 yards per catch). Quarles came back to his alma mater prior to this season after a legendary coaching career at Maryville (Tenn.) High School. He spent 22 years at Maryville, including 18 as head coach. He was the fastest coach in high school history to 200 wins, finishing with a career record of 250-16 (after a 10-7 start) with 11 state championships in 15 appearances. During one stretch, Quarles led Maryville to a 74-game winning streak. "I think George would be the first one to tell you this has been a great year for him from a learning standpoint," Hendrix said. "Obviously, his track record as an offensive coach speaks for itself." Hendrix said Quarles will likely take over as quarterbacks coach as well, and a new staff hire will come later - possibly after recruiting is wrapped up.